There is one name that anyone who has even heard of the game of baseball knows. There is one name that always, and throughout history, stands out whenever you ask someone else to name the most famous baseball players in history. 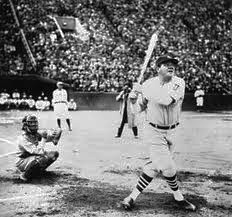 His given name was George Herman Ruth, but he has almost always been known by his nickname: The Babe. Seldom has there been a player who has so dominated his sport and become synonymous with the home run. And, it is true that throughout his career Ruth hit a lot of homers. He also struck out a lot. He was even a pitcher, and a good one, early in his career. Finally, he was a player who made it into the postseason and, more specifically, into the World Series a huge number of times. George Ruth, like most true American stories, had a very humble beginning. He was born to working class parents in a very rough part of the city of Baltimore in 1895. It was a very tough time and Ruth showed how tough he was by just surviving into adulthood. Seven of his siblings died in infancy. He was a two-time All Star. He earned the 1923 baseball MVP award. His career on-base percentage was 1.164. He had a career batting average of .342. With those kinds of numbers, and given the players that were his teammates, it was inevitable that Ruth would make it into the World Series, and more than once. This was certainly the case. What’s impressive is that he ended up earning a staggering seven World Series Championship rings. Babe Ruth was not just a regular season player. He was notorious for carrying his teams into the postseason and once he got there, it seemed likely that the team he was on would come away with a championship. He would help the Yankees earn four World Series titles. The other years he was on the Boston Red Sox, where he was also a starting pitcher. During the 1915 season with the Red Sox he would help the team win a whopping 101 games and a World Series championship. He also was a key pitcher in the Red Sox championships in 1916 and 1918. At one point he had a World Series scoreless streak that lasted 291/3 innings.